For the first time in years, we had a winter in Los Angeles. Well, I use the term ‘winter’ pretty loosely. What we actually experienced was non-summer temperatures and a reasonable amount of rain. For us, that constitutes winter. And the best thing about it, apart from the hills being lush and green instead of dry and brown, is that we get to be excited about Spring. 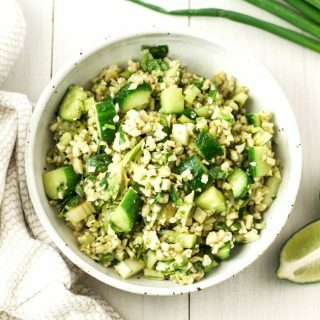 So in honor of the warmer temperatures that arrived this week, I made this green cauliflower rice salad full of fresh flavors and nourishing nutrients. 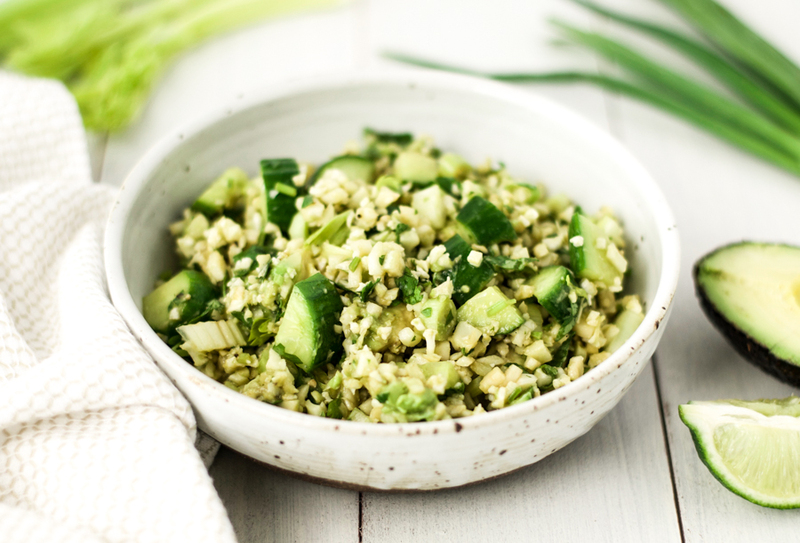 One serving of this delicious cauliflower rice salad contains 100% of your daily vitamin C needs, and more than 1/4 of a woman’s fiber and potassium needs. It also contains a hefty dose of healthy fats. And if you eat it alongside a couple of boiled eggs, you have the perfect balance of carbs, fat, and protein. 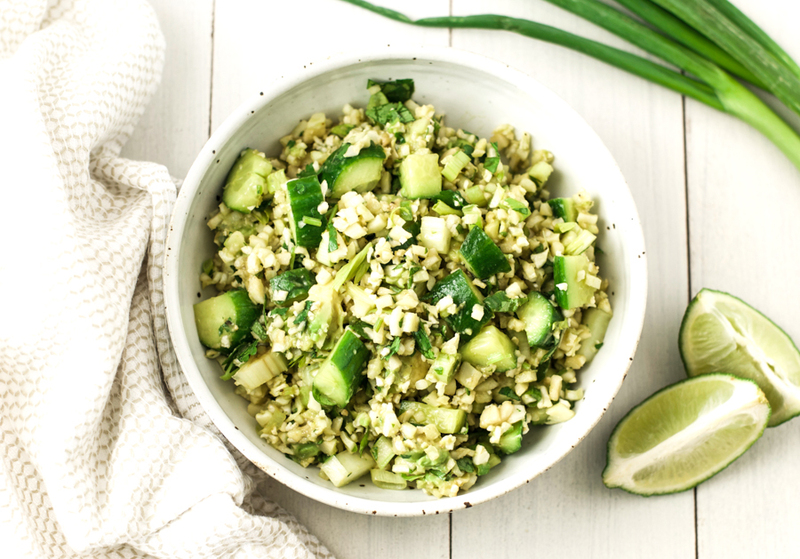 The lime juice and cilantro add to the fresh Spring-like flavors of this antioxidant-rich dish. So if Spring has sprung in your neck of the woods, why not whip up a batch of this tasty salad. 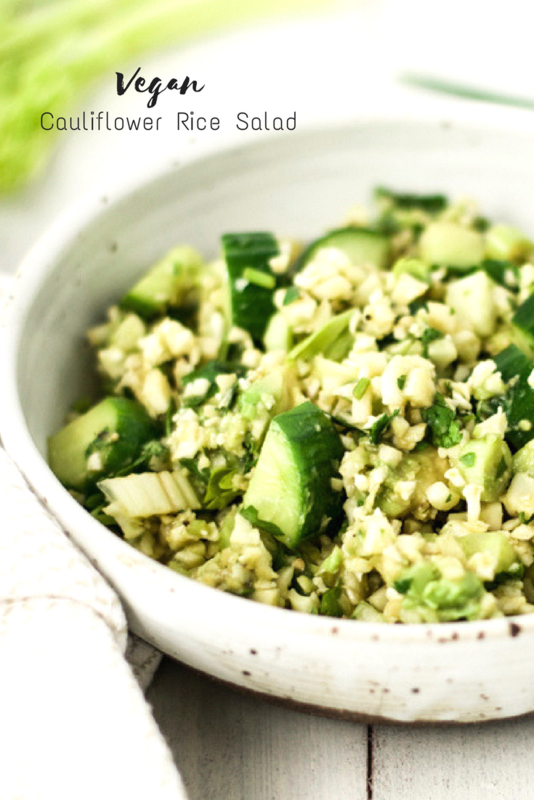 This green cauliflower rice salad is full of fresh flavors and nourishing nutrients. Put all of the ingredients in a bowl and mix well. Serve immediately, or store in an airtight container in the fridge for up to 1 day. 1. Cut the cauliflower head into medium sized florets. 2. Put the florets into a food processor. Do not fill more than 1/2 way. Process in 2 batches if necessary. 3. Pulse the cauliflower in 1-second pulses until it is all the size of large grains of rice. Great recipe! A lovely combination of raw veg with lip-snacking lime and balsamic! It’s super healthy too. It’s still very much winter here (snow included!) but I would have this after a soup or stew. Thank you for your comment Rachel. This would be a great accompaniment to a warm soup or stew. The fresh flavors would compliment the heaviness of the stew very nicely. Thank you Michelle. I hope that day comes soon! Delicious! My family is of the “cilantro hating” variety so I just added a bit of minced garlic to help boost the flavor without it. The receipe tastes light and balanced. I cheated a little with pre-riced cauliflower so it came together in minutes! Thank you!